Sony re-imagines the holidays this season and invites you to discover a brand new way to carol and to make your mistletoe moment better with music. 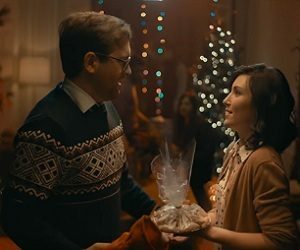 The new ad campaign, titled “Sony Reimagines The Holidays”, includes two spots: “Caroling” and “Mistletoe”. The first one features a group of seemingly very talented youngsters caroling at a friend’s doorstep. As the commercial ends, we get to see the secret behind their beautiful voices: a portable wireless speaker used to play the carol. The second spot, “Mistletoe”, features a young man who gets a kiss on his cheek from the woman he likes after a “special” mistletoe, which is a LED Bulb Speaker, lights up and starts playing a nice song. While the price for wireless speakers range between $49.99 and $699.99, the LED bulb speaker, offering you relaxing sound from above and replacing any standard screw-fitting lightbulb, is available for purchase at $239.99.